← Eat a ducky, Muss! This myth has always intrigued me because I see a quite a Buddhist slant to it. If we are in the middle of doing something, especially boring repetitive daily grind stuff, but at that moment we are just wishing that we were doing something else, then that way of thinking can only make us unhappy. So if I’m doing some boring everyday task, like washing the dishes, but I’m thinking I’d rather be writing my blog or reading a book or enjoying a cuppa, then I’m not really engaged in that present moment – I’m just wishing I was in some other alternative reality, which then makes me feel annoyed or dissatisfied with the present reality. However, the fact is that right in that moment of washing the dishes no other reality exists – this washing-the-dishes is the only reality and reading-a-book is just my imagination pulling me into some other non-existent world. In other words, what you are doing right now is totally real, so why not enjoy it? When you think about it, it’s not the task itself that is boring and annoying, it’s the way we think about it that makes us feel dissatisfied. And if your mind is full of thinking about being somewhere else, then you miss the chance of finding something wonderful that might be right there in front of you, but it might pass by you because you are not really fully aware and present to see it. If I’m doing the dishes, I like to see the rainbows formed in the soap bubbles, or listen to the birds singing outside, or feel the warmth of the water on my hands. This is a meditation. Sometimes, if I’m able to stay present in the washing-the-dishes reality, I feel a great sense of gratitude for this gift of water from the tap, the satisfaction of having had a lovely meal, the good fortune to live in a place where I have the freedom to be safely in my own kitchen doing a simple task like washing the dishes. How lucky I am! And so doing the dishes suddenly makes me feel really happy. If we can start with small meditations like this about daily tasks that seem to take up our time, even the seemingly endless boring repetitions of getting in the car and driving to work or taking the kids to school, when we’d rather be doing something else, then gradually this will encompass our whole lives, so that everything we do can be made into fruitful uplifting experiences that can fill us with joy. In this way, it doesn’t matter what kind of life you live, you can be happy. It is only the wishing-I-was-somewhere-else that makes us unhappy. 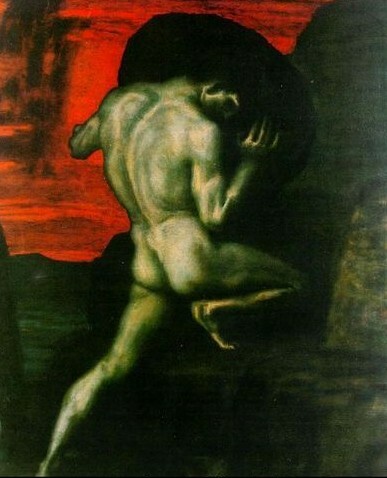 So this is how I can imagine that even Sisyphus can be happy. This entry was posted in Beauty, Inspiration, Meditation, Spirituality and tagged happiness, meditation, Sisyphus. Bookmark the permalink.